NIGHT BASS RETURNS Saturday, AUGUST 25TH TO THE LIZARD LOUNGE COURTESY OF PRIME. This show needs no introduction. 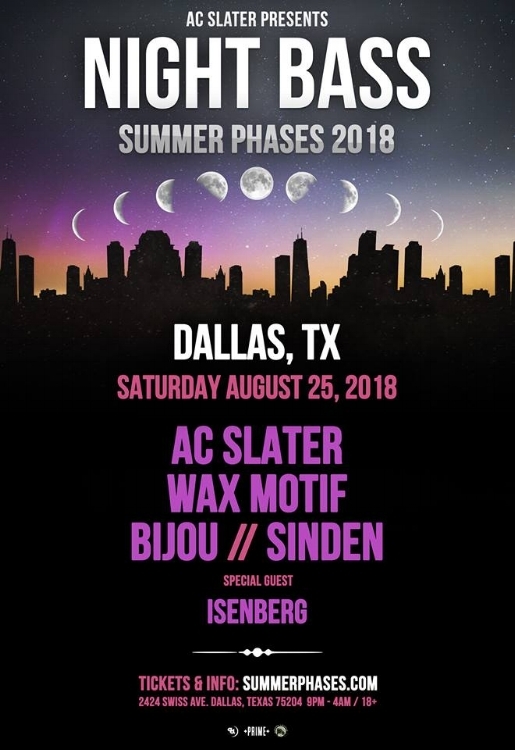 PRIME brings back to Dallas one of the most hype labels in 2018, Night Bass, to the famed Lizard Lounge for the Summer Phases 2018 tour. Featuring AC Slater, Wax Motif, BIJOU and Sinden, you cannot miss out on this one. Topping off the lineup with BRØKEN artist Isenberg, the bass will be rattling, feet will be shuffling and smiles will be adorned on all attendees. After the success of Wax Motif and Isenberg back in March and Phlegmatic Dogs in Dallas and Houston this past weekend, PRIME couldn't not bring Night Bass back to Texas over the summer. Check out the Summer Phases Free Download series on SoundCloud for a sneak peek into the latest music that are bound to be performed that night; including Sinden's new track, "Swervin' in a Lex" featuring Young Lynxx. Check out the video below to get hype for the show on Saturday and let us know in the comments which artist you are most excited to see! Get your tickets for Night Bass Summer Phases Tour 2018 now and PRIME will see you at Lizard Lounge on August 25th.